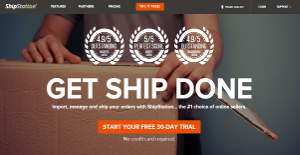 ShipStation is an advanced ecommerce and shipping solution where online retailers can import and manage their orders. This platform doesn’t limit the number of selling channels from where the user can import information, and integrates with a number of shopping cart apps and market places to ensure unobstructed fulfillment. On the large list of available integrations, you will also find popular payment gateways, email providers, and BI tools, or add your favorite shipping service or carrier for free. This system is also one of the rare representatives of its industry that is fully mobile optimized, meaning that the user gets a special app that tracks, ships, and manage orders from all types of mobile devices. As you will read in the Pricing section, ShipStation offers several payment plans where you can easily depict the most suitable one for your company. ShipStation is an all-in-one hub for organized order management that saves companies times and finances. Satisfied users define it as the ideal fulfillment organizer and a leader of its industry that integrates with all carriers, ecommerce tools, and BI systems that make online retail successful. Thanks to this system, companies begin delivering more professional customer service, and avoid easily all delays and costly mistakes. The first thing ShipStation allows you to do is to import order data from an unlimited number of sources, including all popular shopping carts and marketplaces. Once data is inside, you can make use of the system’s advanced features, as for instance automated order and bulk printing labels for your product. The best part of this process is that adding selling channels doesn’t involve recurrent fees. ShipStation won’t restrict you from continuing to work with your preferred carriers and fulfillment providers. You can add all the accounts you’re using, setup and arrange order details in a business-specific fashion, and start delivering in minutes. One of the most distinctive advantages of this system is that it is considerably simple to use – follow the instructions provided by the vendor, and you will run it successfully the very same day you’ve installed it. Another important benefit is that ShipStation preserves the discounted rates from carriers and fulfillment providers (up to 40%), and import those to your free USPS postage account to lower your monthly subscription. Companies have diverse wants and requirements and no software application can be perfect in such a situation. It is pointless to try to find an ideal out-of-the-box software app that fulfills all your business wants. The intelligent thing to do would be to modify the application for your specific wants, employee skill levels, budget, and other elements. For these reasons, do not hasten and pay for well-publicized leading solutions. Though these may be widely used, they may not be the perfect fit for your particular requirements. Do your research, check out each short-listed platform in detail, read a few ShipStation reviews, speak to the seller for clarifications, and finally settle for the application that provides what you require. We realize that when you make a decision to buy Sales Management Software it’s important not only to see how experts evaluate it in their reviews, but also to find out if the real people and companies that buy it are actually satisfied with the product. That’s why we’ve created our behavior-based Customer Satisfaction Algorithm™ that gathers customer reviews, comments and ShipStation reviews across a wide range of social media sites. The data is then presented in an easy to digest form showing how many people had positive and negative experience with ShipStation. With that information at hand you should be equipped to make an informed buying decision that you won’t regret. A very decent ship station. For a shipping platform, it has everything I need. It did great wonders to my business! An all-around product with excellent features and customer support. What are ShipStation pricing details? What integrations are available for ShipStation? Pros: I love how consistent and reliable they are. I never went through any slow downs or a break in internet connectivity. To be honest, I barely ran into any issues. ShipStation is so easy to utilize. It really gets things done. I like how I can offer great service to my customers as a result of this excellent system. Cons: It takes a bit of time uploading and refreshing the "all stores" section in acquiring new orders to show up. I suggest they speed up the upload time. That way, it would easier and quicker in tagging new orders for our warehouse. Pros: I love how it's able to seamlessly merge with our site's platform (Shopify) in tracking/shippung and uploading info quickly. We utilize it for tracking info on all outgoing orders at the same time. It happens to be the only app we know serving such purpose. And it works really great with Shopify. Once you use the UI several times, you'll be familiar with and understand which functionality is suited for the things you need. Cons: Its UI has so many options --- both a good and bad thing. It took some time to properly understand the basics. But when I finally did it, everything was simple. I dislike how it's not able to do a refresh whenever you login. You'd have to do a refresh/re-sync on your Shopify order dashboard whenever you log in everytime. This would ensure your orders are set to be managed. It saved us a lot of hours with manual-based data entry. A true GodSend that did a lot of wonders! It's efficient when it comes to its shipping aspects.